Reports from Daily Mail (cited by Daily Record) indicates that West Bromwich Albion are willing to listen to offers for their winger Oliver Burke who is currently on loan with Celtic. Crystal Palace have reportedly joined the race to sign him, and around a week back, reports from Birmingham Live came out that even the Scottish giants Celtic are willing to negotiate a deal for him. Amidst all this, we would like to see Leeds United target this winger who has managed to find his mojo at Parkhead. 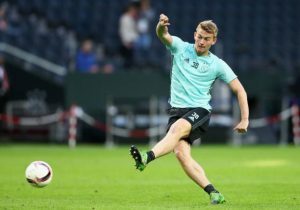 West Brom signed the then 20-year-old from German outfit RB Leipzig in the summer of 2017, but the Scotsman struggled to establish himself with the Baggies. Now, the Whites faithful might feel that if the winger struggled to get game time at Hawthorns in the Championship, then there is no way that he would be able to thrive in the Premier League if the Whites move to the English top flight at the end of this season. However, we think that someone like Bielsa might be able to bring the best out of him and the Scotsman has immense potential. After all, not many 20-year-olds command a £15m pricetag in the first place. His performance for Celtic has been impressive since January and he has even managed to keep out their record signing of all time, Odsonne Edouard from the first eleven on occasions. Moreover, he isn’t a striker in the first place so that indicates how good he can be if he gets regular playing time under his belt. Bielsa would love his versatility to play on the wings or as the man up front. The West Brom ace has that impressive work rate which is embodied by everyone in the current United lineup. The Whites have been after a winger and they missed out on signing Daniel James narrowly. Now the Swansea City winger is in talks over a new contract with the Welsh club so the Whites might have to look at other options in the summer. With West Brom willing to sell the winger, Burke can be a decent addition to the Whites’ squad given his pace, strength, physicality and overall work rate. By no means, the Scottish international is a finished product, but he has looked hungry to prove his worth at Celtic. Someone like Bielsa should be able to get the best out of him. The winger has shown impressive form as he has managed seven goals and four assists for Celtic since joining them in January and United should look to beat the reigning Scottish champions and Crystal Palace to his signature. Rangers’ Chance To Sign Player Of The Year Nominee Improved: What Gerrard Should Keep In Mind? Inter Milan Joins Race To Sign Barcelona Midfielder Amidst Everton Interest: Worrying Sign For Silva? Southampton Eyeing This 30 Y/O German Winger: The Lost Piece In Their Attacking Jigsaw? Tottenham Hotspur Eyeing This 23 Y/O Italian Ace: The Ideal Replacement For Danny Rose? Manchester United Set To Complete Transfer For 25 Y/O Brazilian Midfielder: Right Man For Jose? 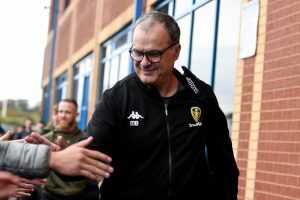 Leeds United Extends Contract Of This Versatile Ace: A Good Bet For Bielsa? Hull City Secure The Deal For This Impressive Chelsea Youngster: A Smart Acquisition?